I've been searching the questions posed here, and don't seem to find one that gives the answers I am looking for. I've proposed to start a list on meta but no one proposed anything, so I feel I must ask this question: What are some books generally regarded as good for a general introduction on philosophy? By this I mean good books that can introduce you to philosophy in general and throughout the times, not to some philosophy or period in particular. This question almost answers mine, except for the fact that most things proposed there are not books, thus not giving me much options to weigh upon. This one regards contemporary philosophy in particular. And this one has the same problem as the first one, plus the fact that it asks for layman's terms, which is not what I am looking for. I've been tempted to buy Will Durant's The Story of Philosophy, but am not sure if it is the best book to get started on philosophy (plus, the book has some mixed reviews). I also checked The Oxford Companion to Philosophy, which seems to be unanimously good, but has the format of dictionary/encyclopaedia, which is not exactly what I am looking for (at least as a main source). The Philosopher's Toolkit also seems to be a good introduction regarding how to do philosophy, rather than to its history and ideals (this also interests me, but I'd rather learn about the philosophers and their theories first). It is also important to point out that I have little notions (or none at all) on philosophy. I would like to read something that covers from classical to contemporary philosophy generally (although I do not know if there is such a book), so that from there I could pick some author, period or branch of philosophy in particular to read further on. So, to sum up, I would like to 'hear' your opinions on what are some books generally regarded as good for a general introduction on philosophy. I'd go with Simon Blackburn's Think: A Compelling Introduction to Philosophy (Cambridge University Press 1999). This is a book about the big questions in life: knowledge, consciousness, fate, God, truth, goodness, justice. It is for anyone who believes there are big questions out there, but does not know how to approach them. Think sets out to explain what they are and why they are important. Simon Blackburn begins by putting forward a convincing case for the study of philosophy and goes on to give the reader a sense of how the great historical figures such as Descartes, Hume, Kant, and Wittgenstein have approached its central themes. Each chapter explains a major issue, and gives the reader a self-contained guide through the problems that philosophers have studied. The large scope of topics covered range from scepticism, the self, mind and body, and freedom to ethics and the arguments surrounding the existence of God. Lively and approachable, this book is ideal for all those who want to learn how the basic techniques of thinking shape our existence. It's not really an introduction to the history of philosophy; it uses a problem-oriented approach, yet it covers most historical classics. Last, but not least: The book is enjoyable to read. Sophie's World by Jostein Gaarder polarises opinion as it is a history of philosophy wrapped up in a children's story. As long as you feel OK with this mixture (and for me at 40 something it was not a problem) then this offers a gentle introduction. What I found especially good was that the explanations of the various philosophers' thoughts were put into a historical context. History of Western Philosophy by Bertrand Russell is usually recommended as a good place to start, haven't read it myself, but it gives you a thorough overview of philosophy and how it has changed over the times. It's usually recommended to read an overview book like this before jumping into a specific philosopher's work. On a side note: there is a sort of reference guide by Stanford here that you can also browse through to get an overview of some philosophical concepts. I have enjoyed the DK Publishing's The Philosophy Book(1)(2). It is an intro, it is basically written, and covers most of the topics. To the complete novice learning about philosophy can be daunting - The Philosophy Book changes all that. With the use of powerful and easy to follow images, succinct quotations, and explanations that are easily understandable, this book cuts through any misunderstandings to demystify the subject. Each chapter is organised chronologically, and covers not only the big ideas, but the philosophers who first voiced them, as well as cross-referencing with earlier and later ideas and thinkers. The Philosophy Book untangles knotty theories and sheds light on abstract concepts, and is perfect for anyone with a general interest in how our social, political, and ethical ideas are formed, as well as students of philosophy and politics. Sorry for turning up so late to the party. The front door was locked so I had to climb through a window. Four people with radically different outlooks on the world meet on a train and start talking about what they believe. Their conversation varies from cool logical reasoning to heated personal confrontation. Each starts off convinced that he or she is right, but then doubts creep in. 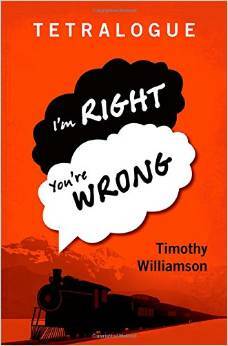 In a tradition going back to Plato, Timothy Williamson uses a fictional conversation to explore questions about truth and falsity, and knowledge and belief. Is truth always relative to a point of view? Is every opinion fallible? Such ideas have been used to combat dogmatism and intolerance, but are they compatible with taking each opposing point of view seriously? This book presupposes no prior acquaintance with philosophy, and introduces its concerns in an accessible and light-hearted way. Is one point of view really right and the other really wrong? That is for the reader to decide. I'm going to answer my own question with Will Durant's The Story of Philosophy, just to see how many votes it gets. Easily the most engaging writer of Western intellectual history in the English language, Will Durant breathes life into philosophers and their ideas. He is colorful, witty, and above all, informative. Beginning with Socrates and ending with American philosopher John Dewey, Durant summarizes the lives and influence of philosophy's greatest thinkers, painting them with humanity and adding a few of his own wise platitudes. Seventy-some years after its first printing, The Story of Philosophy still stands as one of the best of its kind. "The Story of Philosophy" chronicles the ideas of the great thinkers, the economic and intellectual environments which influenced them, and the personal traits and adventures out of which each philosophy grew. It studied the thought of past philosophers by investigating a particular subject (such as existence). It's freely available online at the above (and other) links. I abbreviate with the noun 'exordium (plural exordia)' to mean: short introductions to philosophy < 500 pages for people with 0 experience in philosophy. My personal (though amateur) experience suggests this order of reading (where 1 is the easiest), because I found Blackburn's book difficult in a few chapters. Beyond 2 above, the 'Very Short Introductions' series also covers and ramifies into the subfields of philosophy and different philosophers. See its inventory for Philosophy and for all subjects. A Little History of Philosophy. Philosophy for Everyone (2013) by Matthew Chrisman, Duncan Pritchard, et al. Think: A Compelling Introduction to Philosophy by Simon Blackburn. Perchance my other question on textbooks may interest you. If you like reading you must check out Copleston's A History of Philosophy. The most thorough 'introduction' that I know of. If you are looking for a text that has a good introduction of sorts, here is the text used by many universities across the world: The Philosopher's Way: Thinking Critically About Profound Ideas by John Chaffee. The online package is interesting too but that isn't required so much. If you can get a second-hand book, it should be quite sufficient. While desultorily browsing on Amazon.com, I chanced upon the following how-to guides from publisher Granta UK on famous philosophers and writers; so I haven't read them myself but thought to tender them anyways. If anyone has read them, please feel free to advise and evaluate. I haven't read many books of Philosophy, but if you wish to learn about its history, Sophie's World is an awesome book by Joestin Gaarder. It starts with Socrates, going all the way until our modern age, including the "student's" point of view, as Sophie is actually learning philosophy as you read it. Others than those, there are a lot of movies that make you think philosophically, even though they tend to be better if you know what to look for. I think that the many 'Introduction to philosophy' texts suggested by other answers may not be the best place for you start. This is a very short and breezy read. I think its also one of the most well written works of philosophy that we have. This answer suggests introductory textbooks, but see my other answer if you prefer to commence with short introductions of fewer than 400 pages. I omit quotes to facilitate reading. A better, more systematic, but more difficult treatment is given in Introduction to Philosophy: Classical and Contemporary Readings by John Perry, Michael Bratman, John Martin Fischer. If you don't find it bland to read it, I would strongly recommend picking it instead as you could get a sense of the flow of ideas better. Hank Green recently started CrashCourse Philosophy in YouTube, it's still ongoing (at episode #10 at the time of this writing), but you can browse the previous titles to see its current coverage. It's very geared toward beginner/layman. There is no intimidating use of unexplained terms/concepts. Not the answer you're looking for? Browse other questions tagged reference-request history-of-philosophy contemporary-philosophy or ask your own question. What are some good books about the history of philosophy in the 20th century?